Do you want to start living your dreams? It is possible, however, you must take action. You can’t hope that it will happen on its own. It isn’t impossible, but you do have to plan and take the necessary steps on the journey which takes you in the right direction. Creating your dreams and making them possible is something you should never let go of and always take steps towards your dreams and to live your life to the fullest! I have gone over and over planning, it is the only thing that will help you reach your goals. However, it is important to know how to plan to get the results you are looking for. There are planning tips everywhere; however, when I was looking into the need to plan to reach my goals, I just didn’t know what it all meant. The information was vague, or so set on a particular system, that it was almost impossible to move forward or to learn from these brief encounters with people who all claim to know how to plan and get the results. The problem I found was the lack of information or really hand-holding in the vital parts of my planning. I was planning but unable to put the focus on the right areas because I just didn’t know what they were. My planning at the best was just lists of things I needed to do, but no real focus or understanding what that process will bring. I lacked the knowledge on how to bring my goals down to something that I could actually achieve and to see the progress I was making and the steps it took to get towards my dreams. I was planning but my plans lacked the most important element, I was unsure of the true intention of my plans or how I was even going to make them work! You have to have dreams and goals before you can plan, without these you won’t know the path to take or the actions to take. You won’t know if the path you choose will take you towards the future you wanted. Breaking these into long, medium and short-term goals is a popular option, unfortunately, I just didn’t understand how to do this or how to make them into something that I could achieve. No matter the amount of information I searched for in this area, I never found what I was looking for. No one would go into the detail I needed to truly understand this process. Which is why I want to make sure that understanding on how to turn dreams into reality, is clear. You need to dream big, what do you want your future to look like, and the time frame in the future. My big goal is to make a successful business from my blog. But I need more information than this, I need to know what this success looks like. I need a framework to understand when I have reached this ideal. This is the basic framework for what I think that the success will look like; however, this is a long-term plan and to manage this in the future I need to take steps now that will help and support these concepts down the road. I have to work at the different areas and there are a lot of things to do that will add to the bigger picture. Therefore, I know that just to increase my readership there are lots of different tasks that I can do each month and each week that will help me reach these goals. It means I can set milestones which help me to measure my success and to ensure that I am on the right path towards my goals. It is important when you are creating these goals and dreams that you go into the detail. What steps you will need to take in order to reach these goals. Only when you have the detail will you be able to see the paths that you need to take and the short or medium term goals that will take you in the right direction. The planning and the details matter, without these you don’t have the solid ground to build upon and you will struggle to start living your dreams. This works with all goals and dreams, you have to create the detail, understand what success looks like and to think of the things that you need to do in order to reach those goals. When you think about the details you need to cover, breaking these down into plans and steps you need to take and the order you need to complete these tasks, it becomes easier to see and to break down into those smaller tasks. The detail comes from asking questions like how do you intend to reach the goal, what are the obstacles that are in your way? How will you track your progress and what will success look like to you? What is your best tip to start living your dreams? Therefore, it is important that you understand the details when making your plans and dreams. It is great coming up with an idea or goal, but having the practical actions that you can take to reach your goals and to start living your dreams is a must! If you are looking for other articles on this topic head over to the landing page where you will find links to other articles on planning. I wrote this article and I think you will love it! 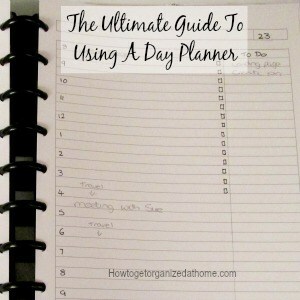 The Ultimate Guide To Using Your Day Planner. Do You Make Your Children Do Chores?